Photo report of last week’s Mini Holland tour of Waltham Forest courtesy of Olawale! We had a great day on Saturday at Woodgrange Market, helping a number of people of all ages and from all backgrounds get their bikes back on the road. 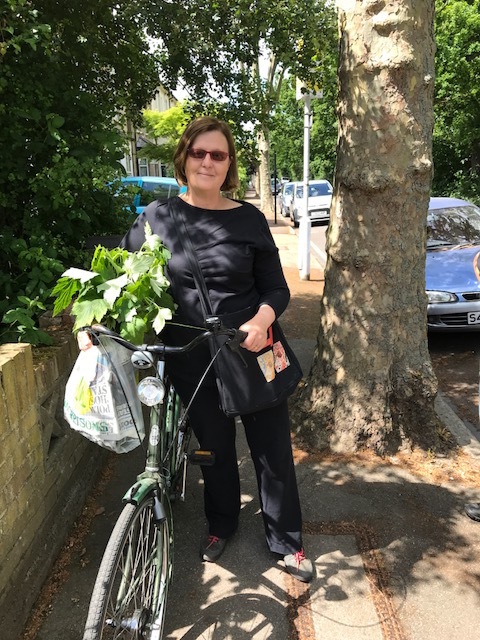 One of our favourite visitors was Jan who had not ridden her bike for 4 years and wanted to get back on it. She had a lovely dutch Gazelle bike which had a flat tyre & needed some general TLC. We helped her replace the inner tube & get the wheel back on her bike. She was spotted riding around Forest Gate the next day! Our aim is to teach as many people as possible – especially women – to deal with basic problems, in particular fixing a puncture! A few weeks ago, Woman’s Hour had a whole feature on cycling including this great video with Jenni from London Bike Kitchen which does just that, with some great tips & tricks! Our next stall is on Saturday 10th June – see you there! As mentioned at the AGM, there is going to be a cycling ‘networking’ event at the Gate in Forest Gate later this month. Â The details are below. Â If you are interested in helping out, please let us know – and please spread the word to your non-cycling friends!